Copyright © 2013 Paul V. Flanagan et al. This is an open access article distributed under the Creative Commons Attribution License, which permits unrestricted use, distribution, and reproduction in any medium, provided the original work is properly cited. A marine sediment core obtained from a methane seepage site off the northern coast of Ireland was analysed, at 3 depths, for catabolic genes associated with the aerobic and anaerobic degradation of aromatic compounds. Catabolic gene copy numbers varied through the core peaking at 2.1 meters below sediment surface (mbsf)-just above the sulphate boundary. Beyond the sulphate boundary gene copy numbers fell considerably, suggesting the boundary may be a critical factor in the degradation of aromatic compounds within marine sediments. At the 2.1 mbsf depth our data also suggest that known benzoyl CoA reductase utilizing bacteria are readily detectable. The importance of marine sediments, in terms of bioremediation, has grown significantly in recent times . Various studies show that marine sediments, and the indigenous microorganisms therein, possess the potential to degrade a wide array of aromatic compounds . Benzene, a classical, persistent aromatic compound , has been shown to be degraded in laboratory microcosms under anaerobic conditions where marine sediments were used as a source of microorganisms in the presence of nitrate or sulphate as an electron acceptor [3-5]. Both monocyclic and polycyclic aromatic compounds, have been shown to be degraded under a variety of conditions when marine sediment is used as a source of microorganisms in enrichment studies . The discovery of catabolic gene sequences associated with the degradation of aromatic compounds from marine sediments via metagenomic research consolidates the fact that eubacteria associated with these sediments are capable of carrying out diverse aromatic compound degradation under both aerobic and anaerobic conditions . This is of particular relevance as aromatic substrates commonly occur in marine sediments, and are derived from both natural and anthropogenic sources. Hydrophobic aromatic compounds commonly migrate and exhibit recalctrance in marine sediments . However, despite the importance of microbes associated with the degradation of ubiquitous aromatic compounds, little is known about their actual distribution in marine sediments and subsequently their role in the degradation of these substrates. In recent work we characterised a 6 metre marine sediment core from a methane seepage site  and found that chemistry and microbial activity in the core are influenced by the presence of methane and sulphate. In this study we wanted to investigate the quantities of benzoyl CoA reductase (bcr) and benzoate dioxygenase (bdo)- catabolic genes associated with the anaerobic and aerobic degradation of various aromatic compounds—at defined depths—as markers for microbial activity associated with aromatic degradation. We then wanted to consider the significance of these data in conjunction with the nature of the overall eubacterial population from within the methane seepage site. We wanted to see if heterotrophic aromatic substrate-degrading bacteria also played a potential role in the carbon cycle in these methane-rich sites. Sediment samples were collected, characterised and stored as described in our previous work . Frozen sediment was taken at 0.2, 2.1 and 5.9-metre depths from a single core. Total DNA was extracted using a combination of heat and chemical lysis to disrupt microbial cells . Total DNA was then subjected to purification with chloroform: isoamyl alcohol (Sigma). Finally DNA was precipitated with 0.6 volumes of isopropanol and eluted in 100 µL of sterile TE buffer. Extracts of DNA were quantified spectrophotometrically as described in the literature  and stored at −20˚C. 16S bacterial rRNA polymerase chain reactions were carried out using DNA Engine DYADTM Peltier Thermal Cycler. 16S bacterial rRNA sequences were amplified from genomic DNA using universal 63f (5’-CAGGCCTAACACATGCAAGTC-3’) forward primer and 1387r (5’-GGGCGGWGTGTACAAGGC-3’) reverse primer . PCR was performed as follows: denaturation step of 95˚C for 5 min; followed by 33 cycles of 94˚C for 30 s, 55˚C for 30 s and finally 72˚C for 1 min 30 s.
16S PCR products were visualised by UV transillumination (Biorad) and bands were removed and purified prior to cloning using a DNA purification kit (Fermentas). Cloning of 16S rRNA genes was carried out as described previously  at depths of 2.1 m and 5.9 m as these depths were found on either side of the sulphate boundary . Operational taxonomic units (OTUs) were grouped by restriction analysis using Fastdigest RSaI and HaeIII (Fermentas) restriction enzymes. Restriction profiles were analysed on 1.4% agarose gel and each gel was standardized to allow comparison between gels. Clones showing identical restriction profiles were assigned to the same OTU group using a total of 60 clones from 2.1 mbsf and 52 clones from 5.9 mbsf. The nucleotide sequence data reported in this study were deposited in the GenBank nucleotide sequence database under the accession numbers JQ349446 to JQ349503. Lyophilized sediment samples were extracted using the modified Bligh-Dyer method, according to White & Ringelberg . Total lipid extracts (TLEs) were desulphurised by mixing with activated Cu powder overnight. TLEs were fractionated into neutral, glycolipids and polar lipids using solid phase extraction on solvent-cleaned aminopropyl cartridges (Alltech 500 mg Ultra-Clean, USA) according to Pinkart et al. . Phospholipids were transesterified by mild alkaline methanolysis using 0.5 M sodium methoxide (Sigma Aldrich) for 30 min at 50˚C. Fatty acid methyl esters (FAMEs) were analysed using an Agilent 6890 gas chromatograph (GC) coupled to Agilent 5973 N quadruopole mass selective detector (MSD). The GC was fitted with a HP-5MS capillary column (30 m × 0.25 mm × 0.25 μm). Splitless injection mode was used while other GC and MSD operating conditions were as described in Otto et al. . Unsaturation position on monounsaturated FAMEs were identified according to Nichols et al. . Quantification was performed using relative response factors for a model FAME (tetradecanoic acid methyl ester) to 5-α-cholestane internal standard (100 μg∙mL−1). The abundance of catabolic genes was quantified by qPCR using primer pair bdoF/R  for the detection of the bdo gene or BZAQF  coupled to PFR1 (5’TCCTGMCCGCCSATGTCSAG’3) for the detection of the bcr gene. The thermal cycling program consisted of an initial hotstart at 95˚C for 10 min, followed by 35 cycles of 95˚C for 20 s, 58˚C for 20 s and 72˚C for 20 s. Plate reads were taken following each extension step at 72˚C. Gel electrophoresis (Biorad) of products was performed to ensure specificity of product and in the construction of standards. At all other times melting curves were performed at the end of a qPCR run to confirm reaction specificity. All Quantitative PCR reactions were performed in an Opticon 3 real-time PCR machine (Biorad) using the Maxima SYBR Green MasterMix (Fermentas). Each 25 µL reaction contained 1 µL of template DNA and a final primer concentration of 0.35 µM each. Standard curves, for each target gene, were generated using purified PCR products from environmental samples . Briefly, PCR products, specific to each target gene, from environmental samples were excised from an agarose gel and purified using an agarose gel PCR purification kit (Fermentas). DNA concentrations were then measured spectrophotometrically at 260 nm using a microcell cuvette (Hellma). Gene copy numbers were calculated according to the size of the amplicon . The standard curves were linear over 5 orders of magnitude with an r2 value above 0.95. Amplification efficiency ranged from 91% to 105% with samples analyzed in triplicate. Samples of qPCR products were chosen at random, cloned, as described previously  and sequenced to confirm product identity. An overview of the composition of the 2.1 mbsf and 5.9 mbsf bacterial clones libraries is given in Table 1. 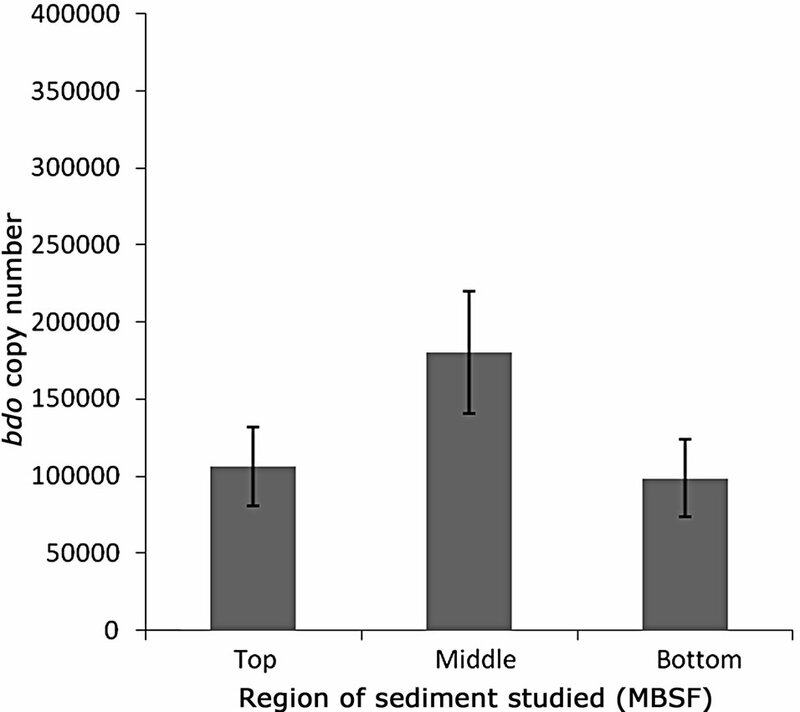 Clone library analysis indicates that proteobacteria are the dominant phylum within this particular marine sediment, representing 93.4% and 98.1% of the bacterial population at 2.1 mbsf and 5.9 mbsf respectively. Also evident in Table 1 is the presence of Sequences sharing homology with Psychrobacter spp and Sulfitobacter spp which are apparent at both the 2.1 m and 5.9 m depths—both known marine sediment inhabitants . Some minor components of the community at 2.1 m but not 5.9 m were shown to be similar to facultative anaerobes previously shown to utilise the benzoate CoA reductase enzyme for aromatic hydrocarbon biodegradation. A notable example here is the OUT group 8—comprising 1.6% of the community at 2.1 mbsf. For both catabolic genes tested it is evident that variations in copy numbers of the genes occur throughout the sediment core (Figure 1). The highest abundance of both bcr and bdo genes is noted at the 2.1 m depth of the sediment (Figure 1) with 3.3 × 105 and 1.8 × 105 copies detected respectively. The lowest abundance of both catabolic genes is observed at the 5.9 m depth where 5.2 × 104 and 9.9 × 104 copies of bcr and bdo are detected. Also evident at the 2.1 m depth is an almost 2:1 abundance of bcr relative to bdo. In total 10 clones of each gene were sequenced, to confirm qPCR product identity, with sequences sharing homologies of 85% - 91% and 87% - 92% to known bcr and bdo genes held within the NCBI database respectively. Table 1. Operational taxonomic unit (OTU) table of 16S rRNA bacterial clone 2.1 and 5.9 mbsf libraries from the pockmark. Figure 1. Mean catabolic gene copy numbers of bcr (a) and bdo (b)/0.5 g sediment were determined by qPCR on DNA isolated from different regions of the Malin core sample. Analysis was conducted on triplicate DNA extractions. Error bars represent standard deviation from the mean copy number. cells∙(g∙dry∙wt)−1 at the sediment depths investigated. Low growth rates, or intermittent periods of rapid growth interspersed by long periods of non-growth and starvetion is the norm for microbes in the environment , with bacterial biomass concentration in marine sediments is usually in the region of 108 to 1010 cells∙g−1 [26,27]. In this study the abundance of prokaryotic biomass appears to be at least an order of magnitude lower than typical at the depths investigated supplementing our previous work which suggested a reduction in microbial activity within the marine sediment examined . The lowest abundance of PLFA’s is noted at the 2.1 mbsf which, incidentally, is where the highest relative abundance of both catabolic genes is observed. This may imply that the viable bacterial population at this depth is lower than other depths examined but of those viable microorganisms, and indeed previous populations at this depth, a high proportion of eubacteria in this region of the sediment may harbor the catabolic genes targeted in this study. However this remains a theory as mRNA studies would need to be performed to link viable eubacteria to expressed genes in this marine environment. 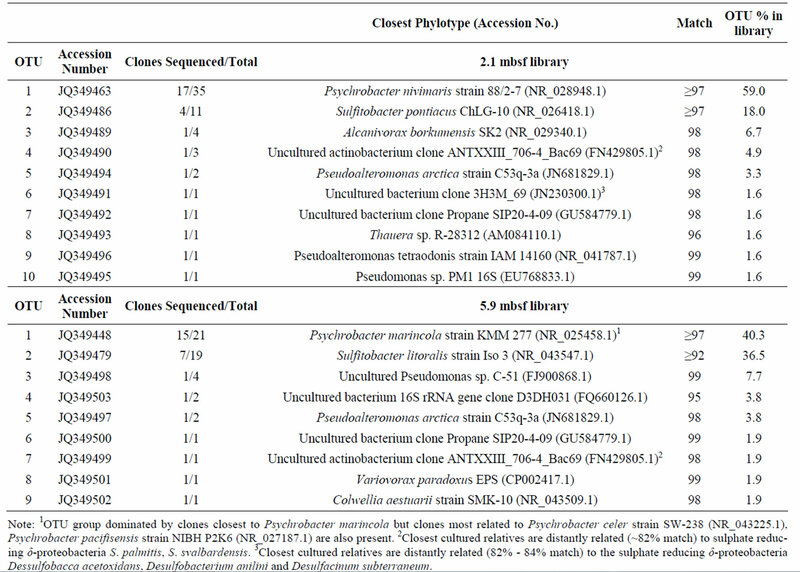 Psychrobacter spp and Sulfitobacter spp are apparent at both the 2.1 m and 5.9 metre depths (Table 1). Both genera have been associated with marine sediments in previous studies [20,28,29]. However as this study focuses on different depths within a marine sediment we observed that sequences from both genera tend to cluster according to the depth at which they are found (Figure 2) indicating subtle differences within relatively similar eubacterial populations potentially being influenced by the chemistry-such as the sulphate boundary-of the sediment region. Also noted in Table 1 is the presence of an OTU group (group 8) whose 16S rRNA sequence shares homology with that of Thauera spp and Azoarcus spp— both facultative, bcr harbouring, β proteobacteria capable of aromatic compound degradation under both aerobic and anaerobic conditions . 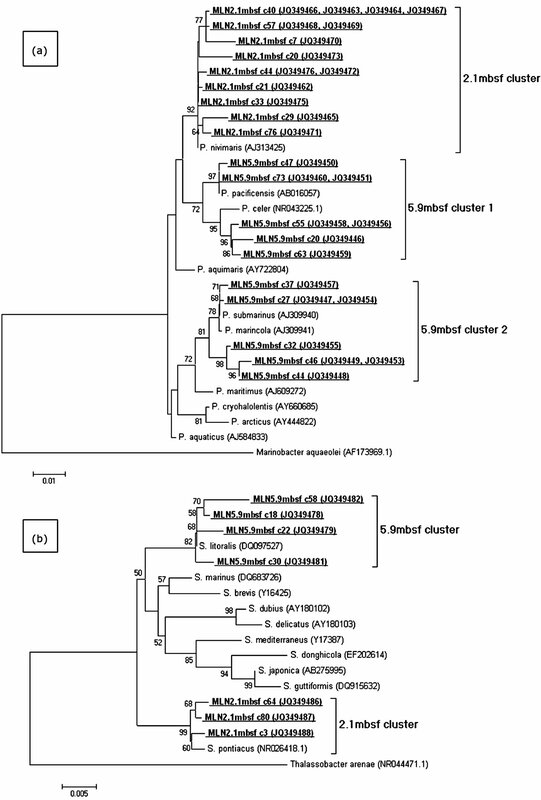 Another OTU group of interest at the 2.1 m depth is group 6 which has highest known species similarity to a desulfobacterium spp—a known sulphate reducer  and aromatic compound degrader via the bcr pathway [31,32]. As stated the highest abundance of both bcr and bdo genes is noted at the 2.1 m depth of the sediment (Figure 1). At this depth aromatic compounds appear to be at the lowest abundance . The aromatic compounds detected within the site are believed to consist of, amongst other groups, benzoate and naturally occurring phenol aromatic derivatives (e.g. vanillic acid). Also evident at the 2.1 m depth is an approximate relevant abundance of 2:1 for bcr relative to bdo suggesting that facultative anaerobes - such as Thauera spp.—may have been metabolic active this region of the sediment. This concept is further enhanced by the detection of sequences sharing homology with known facultative aromatic degraders through clone studies. Intriguingly at 5.9 mbsf more bdo copies are detected relative to bcr. This could be attributed to the presence of bdo harbouring Psychrobacter spp at this depth and the potential redundancy of the energy expensive bcr beyond the sulphate boundary . Figure 2. Maximum likelihood phylogenetic tree for selected clones from the Psychrobacter (a) and Sulfitobacter (b) OTU’s from the 2.2 mbsf and 5.9 mbsf clone libraries. Nucleotide sequences from this study are in underlined bold. Accession numbers are in brackets. The scale bars represent the number of base substitutions per site. The tree was subjected to bootstrap analysis (n = 1000) to assess confidence intervals. Bootstrap values > 50 are reported. This shows distinct clustering of both bacterial populations at the two depths. At 2.1 mbsf Psychrobacter clones (n = 14) are phylogenetically most closely related to P. nivimaris, while at 5.9 mbsf (n = 14) are more diverse and cluster into groups related to P. celer, P. marincola and P. submarinus (Romanenko et al., 2002). Sulfitobacter clones at 2.1 mbsf (n = 3) are phylogenetically most closely related to S. pontiacus, while at 5.9 mbsf (n = 6) are most related to S. litoralis. facultative microorganisms, possibly utilizing sulphate as an electron acceptor, play a vital role in the breakdown of these ubiquitous aromatic compounds within marine sediments. We wish to thank the Geological Survey of Ireland, the INtegrated Mapping FOr the Sustainable Development of Ireland’s MArine Resource (INFOMAR) programme, the Irish Environmental Protection Agency, Science Foundation of Ireland, QUESTOR (Queens University Belfast) and the Irish Council for Science, engineering & technology (IRCSET) for funding this research. The survey data utilized in the research has been co-funded by the Geological Survey of Ireland and the Offshore Irish Petroleum Infrastructure Programme (PIP; Ref. No: IS05/16 Malin Basin EM). F. Musat and F. Widdel, “Anaerobic Degradation of Benzene by a Marine Sulphate Reducing Enrichment Culture, and Cell Hybridization of the Dominant Pylotype,” Environmental Microbiology, Vol. 10, No. 1, 2008, pp. 10-19. J. Zhou, M. Bruns and J. M. Tiedje, “DNA Recovery from Soils of Diverse Composition,” Applied and Environmental Microbiology, Vol. 62, No. 2, 1996, pp. 316- 322. J. R. Marchesi, T. Sato, A. J. Weightman, T. A. Martin, J. C. Fry, S. J. Hiom and W. G. Wade, “Design and Evaluation of Useful Bacterium-Specific PCR Primers That Amplify Genes Coding for 16S rRNA,” Applied and Environmental Microbiology, Vol. 64, No. 2, 1998, pp. 795- 799. D. C. White and D. B. Ringelberg, “Signature Lipid Biomarker Analysis,” In: R. S. Burlage, R. Atlas, D. Stahl, G. Geesey and G. Sayler, Eds., Techniques in Microbial Ecology, Oxford University Press, Oxford, 1998, pp. 255- 288. S. Dhanasekaran, T. M. Doherty and J. Kenneth, “Comparison of Different Standards for Real-Time PCR-Based Absolute Quantification,” Journal of Immunological Methods, Vol. 354, No. 1-2, 2010, pp. 34-39. N. Rajendran, O. Matsuda, Y. Urushigawa and U. Simidu, “Characterization of Microbial Community Structure in the Surface Sediment of Osaka Bay, Japan, by Phospholipid Fatty Acid Analysis,” Applied and Environmental Microbiology, Vol. 60, No. 1, 1994, pp. 248-257. M. Boll, G. Fuchs and J. Heider, “Anaerobic Oxidation of Aromatic Compounds and Hydrocarbons,” Current Opinion in Biotechnology, Vol. 6, No. 5, 2002, pp. 604-611. S. Sehnell and B. Sehink, “Anaerobic Aniline Degradation via Reductive Deamination of 4-Aminobenzoyl-CoA in Desulfobacterium anilini,” Archives of Microbiology, Vol. 155, No. 2, 1991, pp. 183-190. J. D. Coates, J. Woodward, J. Allen, P. Philip and D. R. Lovley, “Anaerobic Degradation of Polycyclic Aromatic Hydrocarbons and Alkanes in Petroleum-Contaminated Marine Harbour Sediments,” Applied and Environmental Microbiology, Vol. 63, No. 9, 1997, p. 3589.